“Memoris Red Eclipse” has become Louis Moinet’s anthology timepiece, celebrating the bicentenary of the invention of the chronograph – a very limited edition of twelve fully hand-engraved watches. This top prestige version features a bespoke case, fully hand-engraved and depicting the theme of the lunar eclipse. All the movement’s finishes are also hand-crafted using authentic, traditional Fine Watchmaking processes. The bevelling brings the mechanism to life, on a mysterious starry background. 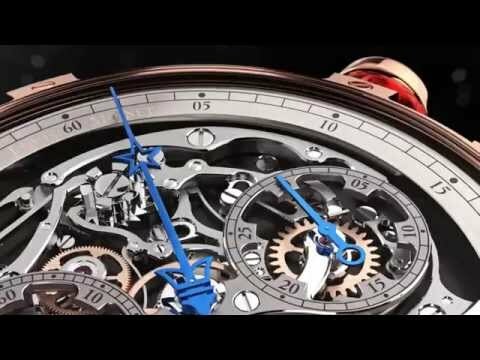 This is crafted using a traditional rose engine – a tool which, despite being all of two hundred years old, has just found a new application, thanks to Memoris. The unique process creates a spectacular effect that makes the stars twinkle in myriad ways, depending on the angle at which they are viewed. Automatic click movement with chronograph function on dial; hours and minutes off-centre at 6 o’clock. Decoration: Côtes de Genève, diamond-polished facets, diamond-cut chamfers and circular gears with 5N colour finish and straight-line steel.